We are successfully meeting the varied requirements of our clients by providing the best quality range of Vegetable Basket. It is made of stainless steel and coating of nickel metal. Basket weaving (also basketry, basket making, or basketmaking) is the process ofweaving unspun vegetable fibres into a basket or other similar form. People and artists who weave baskets are called basketmakers and basket weavers. 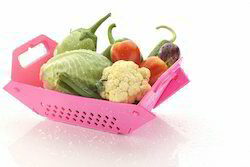 We have in offer, a wide assortment of Vegetable Baskets. As the name suggests these are used to store vegetables. You can store vegetables either in polybags or in loose form. 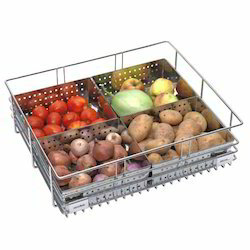 These baskets ensure easy movement of air that keeps vegetables fresh for a longer duration. We have an outstanding range of Fruit Baskets for our esteemed customers. Different fruits can be placed in the baskets and presented on a dining table. Available in various sizes, attractive designs, shapes, the fruit baskets also incorporate salient features. The features include, corrosion resistance, sturdy construction and reliable performance. Light Green Vegetable Basket 16"